Do you own an iPhone and iPad ? Here is a handy utility for you. PhoneClean 4 can clean your device to save space , help you to remove sensitive data from your device and many more. This utility help you to delete messages (SMS, iMessage, MMS and media attached to it) permanently from your device. With just one click you can clean the space occupied by the temp, cache, cookie, off-line and many other kinds of junk files. It can also remove the corrupt downloaded files to save storage space. PhoneClean allows you to close all the background processes in just one click to save memory. This application properly backup your data, so that it will be easy to recover files which you deleted accidently. PhoneClean can do jobs like removing duplicate contacts, corrupt or duplicate media contents. One year subscription of this utility will cost you $19.99 while a personal license will be $29.99. 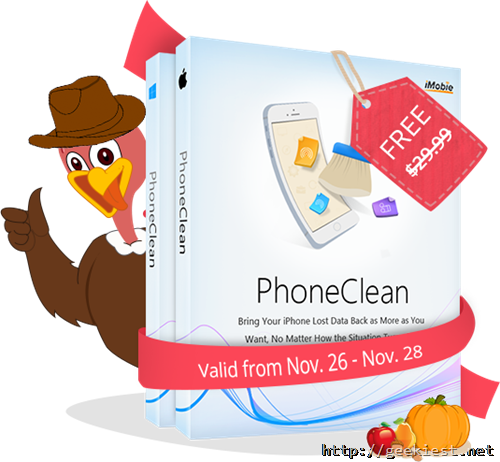 For this Thanksgiving the developers are giving away unlimited licenses of PhoneClean 4 (Personal license) for a limited time.Get it from here. This offer will end on November 28, and remember you will have to activate the license you received before November 29, 2015 at 00:00 am PST. You can also get AnyTrans (Transfer, manage & back up iOS contents – all in one place) by the same developer for 50% price from the same page. Grab PhoneClean 4 for your iPhone and iPad for FREE for a limited time.